In the 12 weeks following an endorsement, weekly adult fiction book sales decreased by a statistically significant 2.5 percent….All of the estimates show greater sales decreases, suggesting that a Club endorsement had a business stealing effect….Following an endorsement, the sales of classics rose by 3.5 percent . In contrast, there were statistically significant decreases for mysteries and action/adventure novels. Romances also saw a sales decline….These estimates demonstrate that while the endorsements had no effect or even decreased overall sales, they caused a substantial shift in the types of books being purchased. 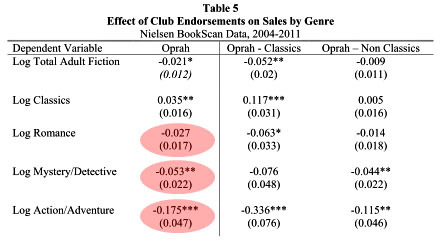 Club selections were longer and more difficult than the bestselling titles in the genres that were popular among consumers likely to respond to the endorsement. Assuming that longer and more difficult books will take more time to read, the difference in estimated grade level combined with the genre-level sales shifts help explain the pattern of aggregate sales declines in the main results….Taken together, these estimates suggest that the difficulty of the endorsed titles contributes to the aggregate sales decline. Roger that. While millions of Oprah fans were pretending to slog their way through Faulkner and Tolstoy, they were too drained to read their usual light fare. So the beach reading genres suffered. And if my cynical view is correct, the net effect was to reduce the total amount of reading among America’s households. We read less crap, but probably didn’t make up for it by actually reading the doorstops endorsed by Oprah. Most of us probably plowed our way through a chapter or two, then slowed down to a page here and there, and finally gave up in exhaustion. But I admit that this is a dim view. Perhaps Garthwaite’s next paper should tackle the question of whether people who bought Oprah’s recommended books actually read them.